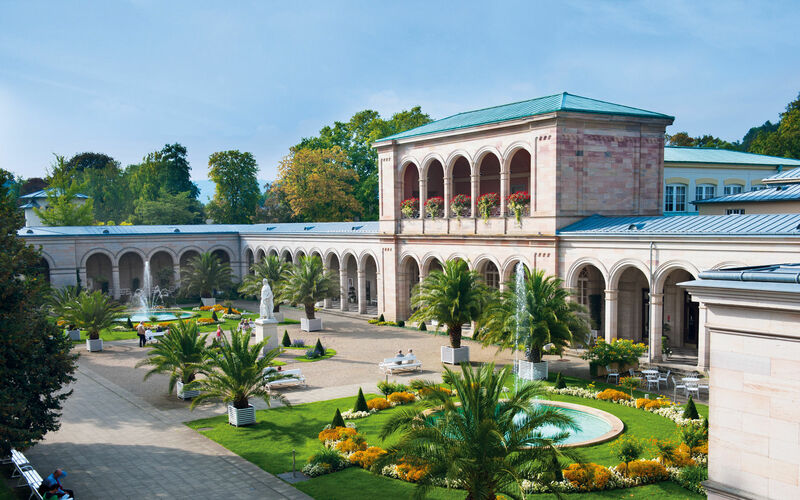 In 1834, King Ludwig I commissioned his architect Friedrich von Gärtner to create covered areas for guests in the ‘Kurgarten’ (Spa Garden). The ‘Arkaden’ (Arcades) were built in the classical style and were first used in 1838. They were later extended by Max Littmann a good 75 years later. Today the ‘Rossini Saal’ (Rossini Hall), the Schmuckhof Salon, the Littmann Studio and the Fontane Salon are located there. They are used for conferences and cultural events. In the ‘Arkaden’, you can find the tourist office as well as a reading room with the latest newspapers and magazines. Did you know: In the Kurgarten Café under the Arkaden, you can relax and watch the world go by, enjoying coffee and cake – in all weathers.